I spend a lot of time emailing files to folks. Sometimes, it's just a small Word document that I'm firing off to an editor, but often the files are a little heftier, containing multiple images or videos. I often send an email containing all of the files, and then a follow-up message, just to confirm that my oversized message arrived safely. But not anymore: Now I'm using Ge.tt (various pricing, starting at free). This free file sharing service has made my life a whole lot easier. 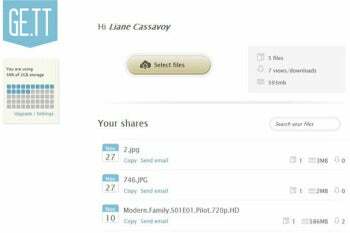 Ge.tt offers an easy and super-fast way to share files, no matter how big they may be. Ge.tt is available as a Chrome extension, but also works in any major browser, and no account is needed to use the service. Registering for a free account will get you 2GB of storage and the ability to store files for an unlimited amount of time. If you choose to use the service without registering, you'll get 250MB of space, and your files will be deleted after 30 days. Paid accounts offering more storage start at $5 per month. Sharing files is simple: Click Ge.tt's link and navigate to the files you'd like to upload. Unfortunately, there's no way to select an entire folder or multiple files; you have to select each file individually. But the good news is that you can share files before they've finished uploading. As soon as you tell Ge.tt which files you're uploading, the site lets you share them by email, on Facebook, or on Twitter. And your recipients also can begin downloading them before the uploads are finished: as soon as Ge.tt gets a request to download a certain file, it turns its attention away from your other files and concentrates on the one that's being requested. I tested this feature with a large video file, and Ge.tt did indeed let my recipient start downloading it while my upload was still ongoing. Ge.tt also offers statistics, so you can see how many times your files have been downloaded. That means you can get confirmation that your files have been received without having to waste time sending follow-up emails. If you share files via email, don't waste your time with any more attachments. Try Ge.tt instead: you'll be glad you did.